The Arbuckle Family Blog: Who needs a 29 course meal? Who needs a 29 course meal? I have to admit, I love to eat out. My husband just surprised me and told me that he wants to take me out tonight. I can't wait. There is nothing better than eating a great meal with my amazing husband (and I don't have to cook or clean it up). Forbes just released an article about the most expensive restaurants in the U.S. I am pretty sure I won't ever be visiting any of these restaurants. Ruth's Chris (a place I have never been, but want to dine at one day) seems cheap compared to these. 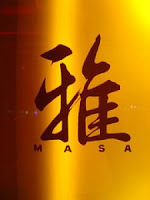 The most expensive restaurant is Masa. It is a Sushi restaurant in New York City. 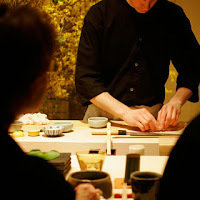 At Masa you get a 29 course meal for around $400 (drinks not included). Really, who needs 29 courses? I went to their site to look up their menu and of course they don't have one on their site, but they do have a $200 cancellation fee if you cancel your reservation. I will admit, I am curious to see what a 29 course $400/person meal consist of... but don't worry, I won't ever find out.